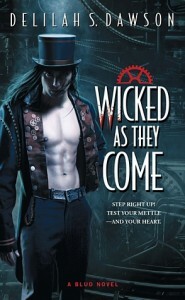 Read my review here...http://badassbookreviews.com/review-wicked-as-they-come-by-delilah-s-dawson/or below.....3 cups fantasy2 cups paranormal romance1 cup steam punk1 tablespoon of historical fiction1 teaspoon contemporaryA dash of time travelMix all together at once, add a touch of magic, a gorgeous alpha male, a woman learning to stand on her own two feet, and you’ll have Wicked as They Come. I LOVED this book. I’ve been hesitant lately giving 5 stars since every time I give 5 stars, I want it really to be a step above all other books in its genre. Well there was NO hesitancy in my 5 star rating for this book. I feel in love with this book at page 10. Seriously. It was magic. It was like I was under a spell and I literally read this book slower than I needed to just because I did not want to end.The StoryTish’s life was just beginning. She left her abusive boyfriend, changed her address, was learning to be assertive, and was just learning what she wanted out of life. She was a nurse, dealing with terminally ill patients including her own grandmother. Tish is attracted to a locket at an estate sale from one of her former patients. She takes it home, and with a struggle, is able to open the locket. That evening, she goes to sleep with the locket close to her heart and with a sense of hope. She wakens to a fantasy world. This is not a regular fantasy but a steampunk Victorian bizarre circus type fantasy The problem is Tish thinks she is still dreaming. She almost immediately meets Criminy, a tall handsome man who tries to convince Tish that this is not a dream.Criminy, my lovely Criminy. Besides being beautiful, alpha, and a magician, he’s also a bludman. A bludman in Sang (the world that Tish finds herself in) is like a vampire in our own world. Except bludman aren’t dead, don’t feel cold, they are just basically a different race that lives on blud (“blood”) instead of food. Criminy is in love with Tish from the very minute he meets her. He knows that Tish is perfect for him because he basically requested her when he made a bargain with a witch for his perfect woman. Tish is what came to his world so he knows she is the one. Tish is unsure of this so-called bludman but she knows she is attracted to him and his dangerous allure.The story revolves around Tish’s growing relationship with Criminy, her fear of trusting Criminy because of what happened to her, Tish getting used to the world around her, Tish wanting to see her Grandmother again but not wanting to leave Criminy or this world. 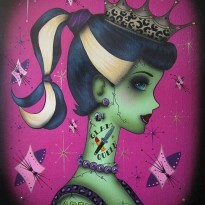 and finally a bad man that steals her locket and Criminy and Tish’s adventure in returning the locket. In other words, the plot IS the world. It’s not fast paced but perfect in its own right. The author immerses the reader slowly into the world, we discover everything right along with Tish and I felt like a kid at a fantasy show in Las Vegas. The characters are unique, the environment scary but intriguing, and the excitement of something new was as real for me as it was for Tish.There are blud bunnies. Predators in Sang are completely different than what is in our world. There are Invisibility spells, love spells, and more but this is not a magic book. There is time traveling but it’s not a time traveling book. There are mermaids, lizard men, and a piano playing “stranger” but this is not a straight fantasy. In other words, this book is the perfect combination of a little bit of everything.OverallI can’t recommend this book enough. It’s like every genre I love so perfectly blended together. If you want to fall in love with two great characters plus an entire new world, this is your book.